The Yankees are whole again. Aaron Judge returned to the lineup yesterday and Aroldis Chapman will rejoin the bullpen tonight. He was activated off the disabled list this morning, the Yankees announced. Chapman pitched through knee trouble pretty much all season before it became too much to bear last month. He missed four weeks. His appearances will be scripted. He’s pitching this day no matter what, etc. He won’t be the closer, at least not right away. Similar to Judge, the Yankees have to get Chapman back into game shape. You don’t miss a month, throw two bullpens and one simulated game, and come back in midseason form. And Chapman is a guy who can lose the plate rather easily after a long layoff. Don’t be surprised if it’s walk city his first outing or two back from the disabled list. Because of that, it’s hard to see the Yankees using Chapman in high-leverage spots right out of the gate. If push comes to shove and they have to use him in an important situation, so be it. I don’t think that’s the master plan though. In a perfect world Chapman would pitch in some blowouts initially and the Yankees can let him work through things as necessary. 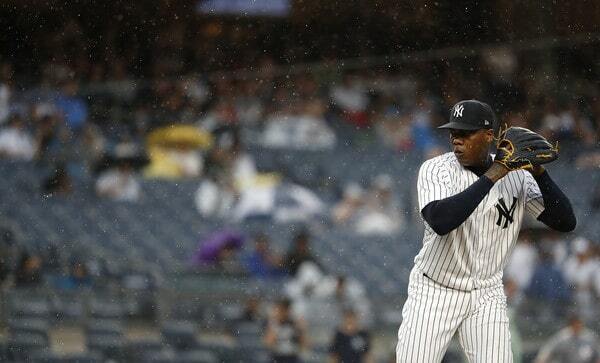 Would Chapman need a closing opportunity or two before the end of the regular season? Eh, maybe. I’m not sure it’s necessary though. He’s been in that role a long time and I think he’d be able to step right back into it with no problems come postseason time. The Yankees have the bullpen depth to cover the ninth inning the rest of the season, if necessary. The most important thing is getting an effective Chapman back regardless of role. No one wants to see him struggle in however many appearances he makes the rest of the season. That would be bad. Chapman coming out and throwing 100+ mph darts with a healthy knee is what we’re all looking for here. If it takes him a few appearances to get there, fine. As long as he does get there. The Yankees are built around their bullpen. They try to win games from the ninth inning forward and that will be especially true in the postseason. Three or four good innings from the starter is all they’re looking for. The bullpen can do the rest, and a healthy and productive Chapman will make that plan much easier to put into practice. The Yankees got their closer back today, and there’s just enough time left in the season to get him ready for October.